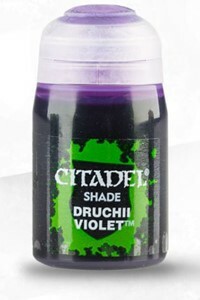 Citadel Shades are specially formulated to flow over other paints and into the recesses on your miniatures, defining details and accentuating recesses. Once applied, they dry to provide very effective, matte shading for your models. Citadel paints are non-toxic, water-based acrylic that are designed for use on plastic, metal, and resin Citadel miniatures.